When you ask a question about where to find something or where to get help you need to remember that "Inter" in Internet is International and WWW means World Wide Web. ALL the World! Our visitors are from virtually everywhere in the world. Click a flag for informtation about that country from the CIA Fact Book. In our flag system's first month (November 5 - December 5, 2012) 149 countries were recorded. The total "hits" were half the total counted by our site wide counters (75,000 vs 150,000). Google analytics on our tailgate pages counted 81 countries from 4,500 "hits" during the same period. The rank and proportions of country hits were roughly the same with the exception of India which was not in the top 20 on google, but has been in 5th position here all this first month. Other flags, banners and International links from anvilfire. Flag Bar representing multiple languages from our Spring 2000 NEWS with translation links. The word anvil in English, German, French, Italian, Spanish, Swedish, Latin, Dutch, Portuguese, Hungarian, Russian and Polish from our anvil gallery. CanIron II anvilfire NEWS Calgary, Alberta Canada 1999 with 57 country visitors list. 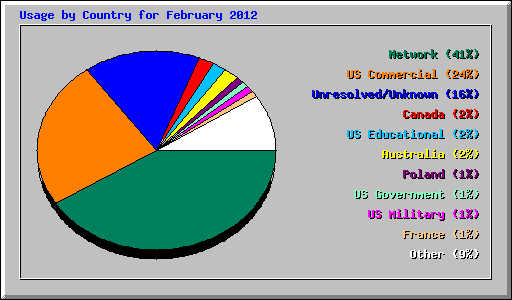 Webalizer graph for anvilfire.com February 2012. 127 Countries The webalizer system uses different methods to determine country. Note that there was 16% unresolved (undetermined). But it also returns the fact that 2% of our traffic is identified as from US educational institutions (.EDUs) and 1% from the US Military (.MIL). Webalizer uses monthly figures and only reports the top 30 countries (but could be configured for more). We use statistics from our own counter systems, Webalizer and Google Analytics. Our system is not a fancy as Google's but the two give similar results where reading Webalizer is an art.